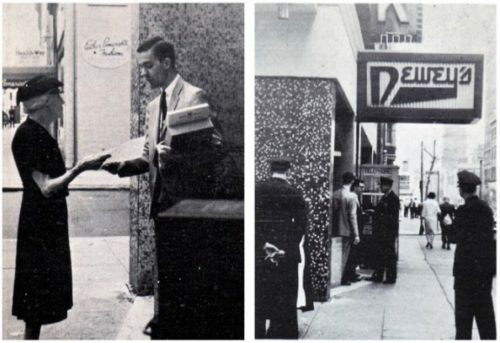 The sit-in at Dewey’s, which occurred at a Philadelphia restaurant in the spring of 1965, is not as well-known as the Stonewall Riots, but it deserves wider recognition. The story of the sit-in at Dewey’s may very well have been forgotten if it were not for Stein. The mainstream media ignored the incident then and it received scant attention from scholars before Stein began his research. Fortunately, a handful of men and women mentioned the restaurant to the historian while he was interviewing them for his book, City of Sisterly and Brotherly Loves: Lesbian and Gay Philadelphia, 1945-72. The police promptly arrested Polak and the three teenagers. The savvy businessman quickly organized a picket outside Dewey’s. Roughly 1,500 pieces of literature were distributed to customers and passersby over the next five days. Finally, on Sunday, May 2, just one week after the initial confrontation, a handful of teenagers began a second sit-in. Studying the sit-in at Dewey’s, Stein discerns significant implications for our understanding of LGBT history. Later in the 1960s, a new kind of LGBT activism emerged: the gay liberation movement, which was more radical than the earlier homophile movement. For many, Stonewall was the momentous beginning of that next phase of activism, but Stein believes otherwise. In the sit-in at Dewey’s, he finds evidence of LGBT militancy beginning much earlier than 1969. “The idea of fighting back, the idea of borrowing tactics from the civil-rights movement, that stretches back 20 years before Stonewall,” he said. Her 2005 documentary, Screaming Queens: The Riot at Compton’s Cafeteria, examines a 1966 incident in San Francisco that is strikingly similar to the sit-in at Dewey’s with one difference: at Compton’s, the drag queens literally punched, kicked and scratched to defend themselves. Ray Simon is an editor and freelance writer in Philadelphia. He has written about everything from cryptograms to drag kings and environmental sustainability to video games. This article was first published on Bilerico.